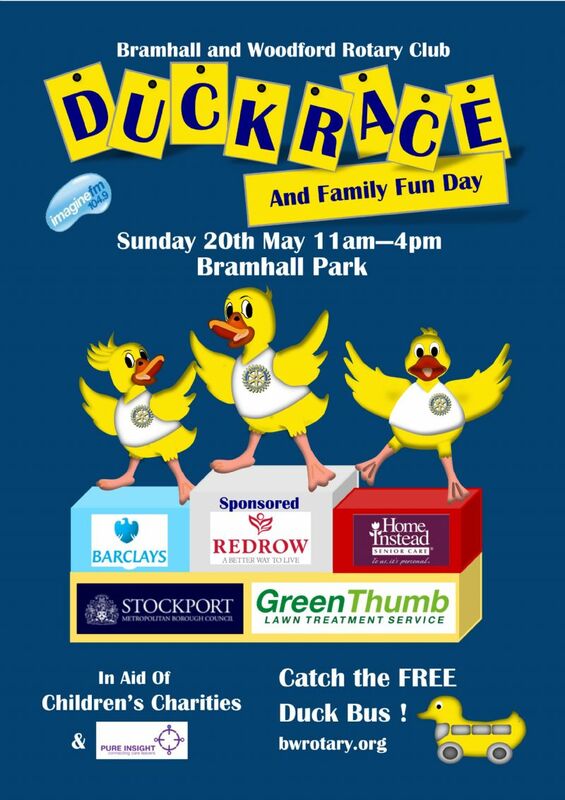 Bramhall And Woodford Rotary Club is, once again, holding the Duck Race and Family Fun Day and this year it will be held at Bramhall Park on Sunday May 20th. The Club is very pleased to announce that Redrow Homes currently creating the Woodford Garden Village have agreed to sponsor this event along with Barclays Bank plc. Home Instead Senior Care based in Stockport and Stockport MBC are also giving us their support. service. So this year the Club will, once again, have not only one but TWO free buses running throughout the day between Bramhall Village (Pizza Express) and the Park plus Hazel Grove High School and Stockport Rugby Club. Track them with the app on our website (www.bwrotary.org) and then look out for the yellow DUCK BUS. Extra parking will also be available at Linney Road Scout Hut. Please use them if you can but, if you have to come in a vehicle, please park carefully and respectfully. Starting at 11.00am, there will be a variety of duck races to watch and there will be speciality races with local celebrities and businesses getting involved by decorating large rubber ducks, who will go beak to beak in the river. There will also be a special challenge race this year. As well as Duck Racing with some fabulous prizes for the winners there will be many sideshows a bouncy castle, games, singers, dancing groups and craft stalls along with ImagineFM and much more including a few special surprises. We have decided that money raised will be shared between children's charities and Pure Insight who deliver projects providing practical and emotional support to young people age 16-28 who have left or are about to leave statutory care and other charities supported by the Rotary Club Pure Insight projects address a range of serious issues including homelessness, loneliness and isolation, poor mental/physical health and lack of opportunities. They support young care leavers in developing skills, confidence, talents and resilience.